Robersonville, NC – Another weekend has come and gone, cars damaged, and winners crowned. This past weekend we were back at the amazing East Carolina Motor Speedway for SATURDAY night racing. Yes that’s right, for the first time this season ECMS held an event on Saturday. The Ronnie Barnette Memorial race in honor of long time tech guy and engine builder at the speedway brought a lot of emotions out of a lot of different people. Track owner Wayne Perry having nothing but incredible words to say and giving a little clue on maybe making this a yearly event. Due to our involvement down there this season, as well as the importance this race was to plenty of officials and drivers we are going to split the recaps up. Hopefully this will make it easier for you to read and give credit to all the drivers who made the trip. 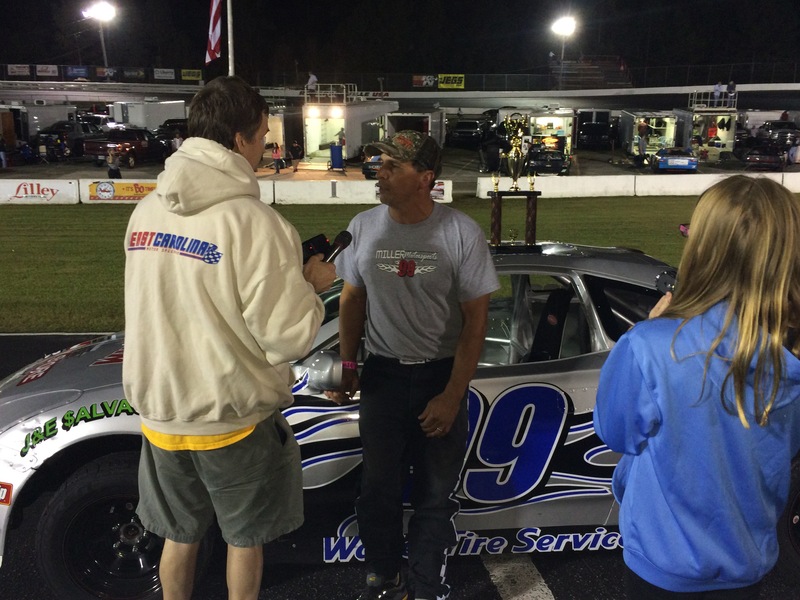 A total of four divisions ran this past weekend on the high banks of East Carolina (UCAR, Street Stocks, Modifieds, Limited Late Models), on the first Saturday event of the year. With the “regular” short track season completed East Carolina wanted to put on a year-end event in honor of Ronnie Barnette, and that they did. Gates opened Saturday early which allowed teams to get to the track, get set up, and have plenty of time to practice and learn the fast line around the speedway. Also allowed other teams that have never been to the speedway to travel for the race. The “Opening Act” so to speak – with no offense to these drivers as they have provided some of the best racing I have seen all season – were the UCAR and Street stock division, twenty and thirty laps respectively for them. Tyler Horne was fast all day long in practice and it showed during qualifying. The track had some technical difficulties during time trials and had to revert back to manual scoring where Horne topped the speed chart with a time of 17.64. A full tenth of a second behind him was Travis Miller clocking a time of 17.78 seconds. James Stroud, David Wiggins, Joseph Pittman made up the rest of the starting five. Once the green flag was out, the it didn’t take long for the front two to check out. I thought we were going to have a caution pretty early with track champion David Wiggins pancaking the wall coming off of turn two. He was able to keep things under him and avoid collecting anyone else, the field remained under green which was good news for the leaders. By lap five Horne and Miller had a half straightaway lead over the field, by lap seven Travis Miller had worked his way around Horne for the lead. Minus a pretty wild moment of three wide racing and working around lap traffic, Travis Miller was able to hold off a heavy assault from Horne to take home the hardware. Tyler Horne, James Stroud, Joseph Pittman and Eddie Wall rounded out your top five. 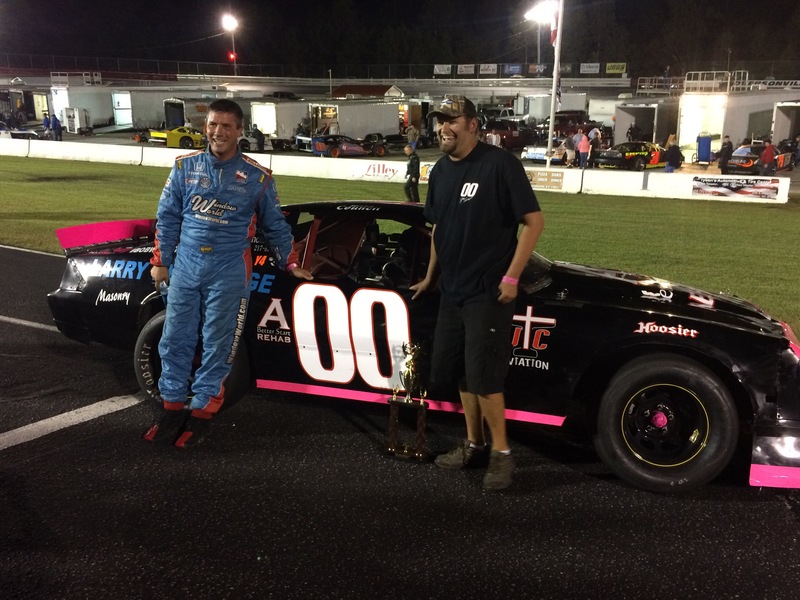 Have to give a shout out to the Langley Speedway UCAR’s for making the trip out and having a blast. Langley runs domestic cars, single overhead cam and mostly steel bodies so they were at a slight disadvantage. Either way Eric Schaffer, Time Wilson, and Jesse Jones (finished in that order) told me they certainly had a good time. I must say I was a little disappointed in the turn out of these cars because the pure entertainment value they bring to the track. It’s the down home, back roads, engine roaring racing you like to see. Six cars took the track earlier in the day for practice, the #82 of Mike Ganoe loaded up and headed out before qualifying. Was not able to catch up with the team to figure out why as they snuck out pretty quickly. This left five cars to hit the track for time trials where 2014 track champion Jesse Council, supporting a familiar black #00 car, grabbed the pole position with a time of 16.97 seconds. To his outside was a familiar driver in a “new car,” Kevin Benton – usually driving the #902 car, and at one point only two points out of the lead – clocked in a time just three tenths of a second slower to earn the second spot. Chris Connor, Paul Williamson, and Tommy Pike made up the rest of the field. When the green flag waved Council jumped on the gas hard looking to take care of business. Clearing the field off turn two Council was a man on a mission leaving everyone else behind him. It didn’t take long to find the yellow flag when Chris Connor & Paul Williamson got tangled up and went for a spin in turn four, both cars were able to roll away with no big damage. As the field went back green Council took off again securing the top spot all to himself. The yellow flag waved again with twelve laps to go for debris, I am thinking it had something to do with the cherry red brake rotors. I am talking it looked like we had traveled to Bristol or something these things were glowing so bright. Once the field got back under green flag condition the final laps were run free and easy for the 00 of Council who again took home the hardware and a pretty good payout if I may add.